5 Sheinton Street, Much Wenlock, Shropshire, TF13 6HS. 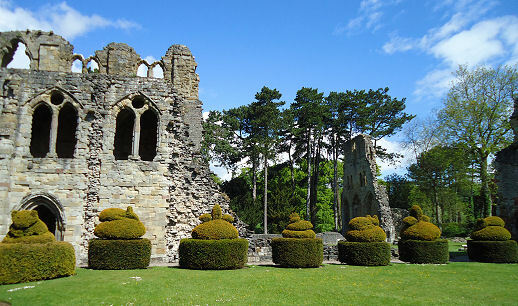 The site of the monastery goes back to Anglo-Saxon times when the first religious site was founded by King Merewalh of Mercia in about 680 A.D. Pilgrims were attracted in number to the site when the bones of Merwalh’s daughter Saint Milburgew were found in 1101. 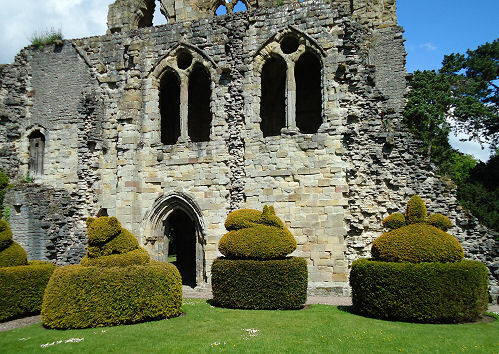 Wenlock Priory had by then been re-founded by the Normans as a priory of Cluniac monks and these are the remains that we see today. 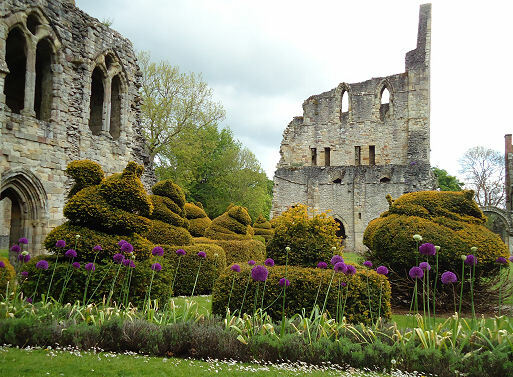 The gardens were laid out in the Nineteenth Century after a new fashion to incorporate gardens into ruins. 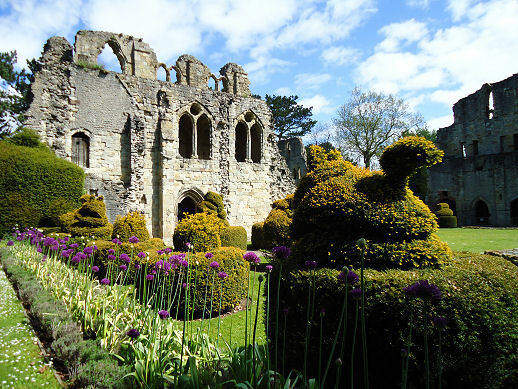 The garden covered the area which was once the infirmary and later became the Prior’s House and is now a private house and garden beyond the cloister garden which can be glimpsed through a locked iron gate. 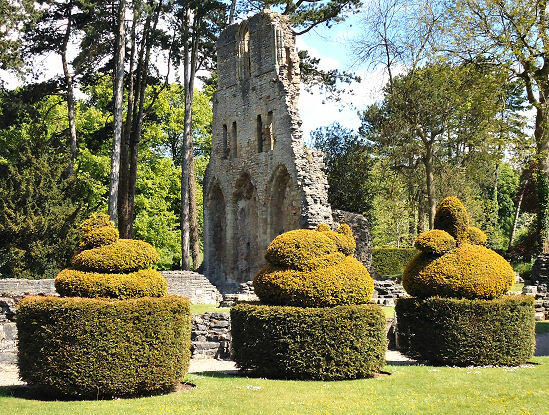 The topiary are to be found in cloister garden surrounding the monks washing house and they are a fine collection even if some are showing signs of dieback and re growth. 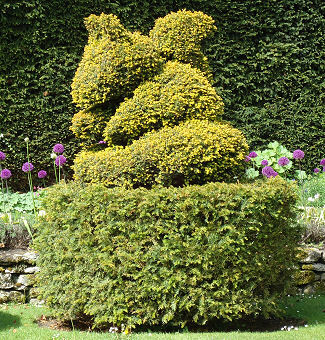 Each column has a different animal, bird or form on them and they sit in a long rank which makes them look magnificent when you first see them on your trip around past the large yew hedge from the entrance. The animals are just the right scale for you to feel you have stumbled upon Peter rabbit’s garden and met all his friends. The skill of the gardeners is evident in that the Teddy Bears have eyes clipped into their head which is in fact quite rare. 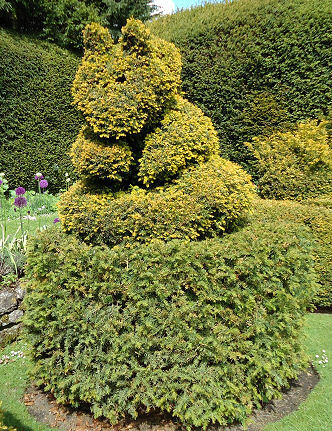 If you can get there in spring the planting in the borders is fantastic and compliments the topiary brilliantly as I hope my photographs show. English Heritage has placed benches around the site so you can sit awhile and soak up the atmosphere and contemplate philosophy. I was reminded of that old cliche saying that you are nearer your god in the garden than anywhere else on earth and in this peaceful place, steeped in religion I think this is more true than anywhere.